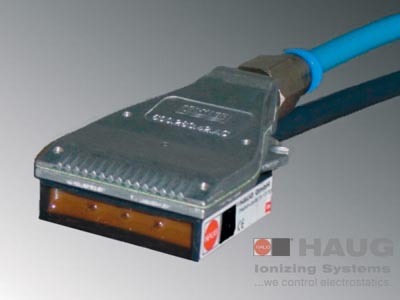 With its air assistance, the HAUG Mini-Jet ionizer MJ II neutralizes electrostatic surface charges highly effectively.It comes into its own in space-critical or complex installation situations, in particular. The air assistance allows positive and negative ions to be conveyed over larger distances. This ion flow neutralizes surface charges on workpieces. Commissioning is effected quickly and without tools by simple screw-connection of the high-voltage plug to the high-voltage power pack. The Mini-Jet ionizer II has proved itself in day-to-day operation as a reliable aid, for example in injection moulding for the removal of electrostatic charges from the surfaces of small plastic parts.